July 9 (UPI) — Mike Pompeo made his first visit to Afghanistan as secretary of state Monday, offering optimism about the Trump administration’s approach to the 17-year war. Pompeo arrived unannounced to meet with President Ashraf Ghani over potential peace talks between the Afghan government and the Taliban. 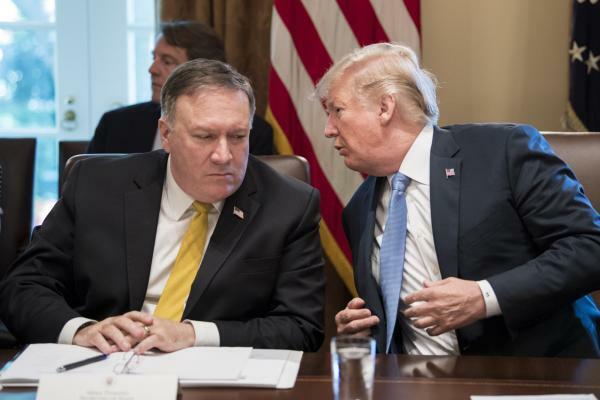 After assessing the United States’ role in the conflict there, Pompeo said he believes President Donald Trump‘s strategy — a conditions-based approach over a timeline-based one — has paid off. A report by the Special Inspector General for Afghanistan Reconstruction, an independent watchdog, in May found that the U.S. government’s effort to stabilize and rebuild Afghanistan after toppling the ruling Taliban has largely been unsuccessful. The report said President Barack Obama‘s decision to send 50,000 more U.S. troops to clear the most dangerous parts of Afghanistan of insurgents in 2009 and 2010 contributed to the overall failure. The so-called surge was intended to create a hold on the area that would discourage the Taliban from returning, but was limited to 18 months. A lack of security left the locals unconvinced they would be able to protect themselves from insurgents if they returned and the brief time period didn’t give insurgents enough time to take over, SIGAR said. Pompeo said there now is hope for progress — with an increase in airstrikes and the deployment of an additional 3,000 U.S. troops. “Many of the Taliban now see that they can’t win on the ground militarily. That’s … deeply connected to President Trump’s strategy,” he said. In June, Ghani ended an 18-day cease-fire with the Taliban, appealing to the group to join a peace process going forward. The president declared the truce 98 percent successful and said it proved the Taliban fighters and civilians want peace. Pompeo’s trip comes two days after an insider attack in Afghanistan killed one U.S. service member and injured two others. The U.S. personnel were involved in training and advising the Afghan military.